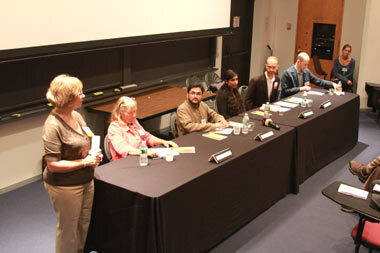 The Peace Islands Institute organized a panel discussion to honor the 10th anniversary of September 11th. 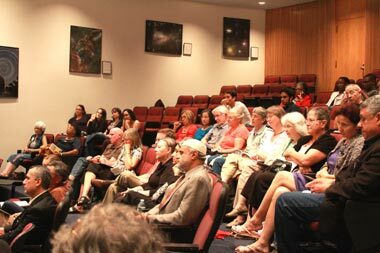 The discussion, which was titled "Into The Light: A Multifaith Conversation on 9/11", was held at Princeton University on September 8th 2011. The program was co-sponsored by Fellowship In Prayer and Princeton University Muslim Life Program in the Office of Religious Life. 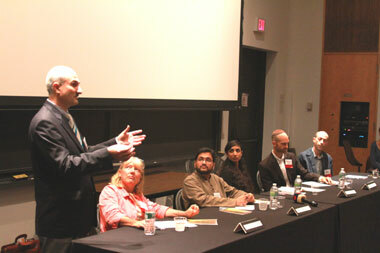 Matthew Weiner, Associate Dean of Religious Life at Princeton University, and former Director for the Interfaith Center of New York, moderated the panel. A long summary of the presenatations is below the pictures. Please roll down the page to read it. 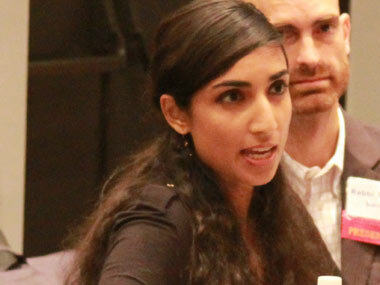 - Valarie Kaur - Sikh American writer/producer; executive director of Groundswell. - Rabbi Justus Baird - Director of the Center for Multifaith Education at Auburn Theological Seminary, NYC. 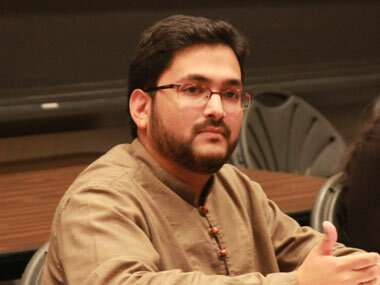 - Sohaib Sultan - Muslim Life Coordinator/Chaplain at Princeton University, lecturer and author on Islam. Valarie Kaur- a Sikh American writer/producer, Rabbi Justus Baird - Director of the Center for Multifaith Education at Auburn Theological Seminary, Sohaib Sultan, Muslim Life Coordinator/Chaplain at Princeton University and Rev. Krystin Granberg-Interim Pastor from Broadway Presbyterian Church shared their perspectives with the audience. Program started with welcome speeches by Janet Haag and Levent Koc, executive directors of the Fellowship In Prayer and the Peace Islands Institute, respectively. 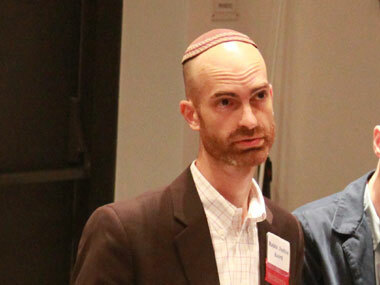 Rabbi Justus Baird, the first speaker on the panel started with Jewish community’s response to 9/11 attacks, stating that this tragedy fit in the narrative of violence and terrorism that Jews were familiar with throughout history. Jews have the narrative of being a minority who has not been often tolerated. He then analyzed the issue from a wider perspective. Auburn Seminary in NY has a program for teens called “face-to-face, faith-to-faith” where they bring teens from South Africa, Israel, Northern Ireland, Palestine and the U.S together in the summer. International participants were also taken to the ground zero. The staff and the counselors were really hounding Rabbi Baird as they were extremely afraid to bring those teens to ground zero, because of the head covering of Muslim girls. They thought it would be dangerous. However, Rabbi Baird was convinced that they were wrong. They went; nothing happened except that they were moved by the individuals’ stories and faces they saw on the screen. These young people, the future leaders of the world, will never know the pre 9/11 world. It is a part of who they are, and the fear and anxiety that this event generated is something they deeply internalized and is something we have to deal with. Rabbi Baird also thinks this event reminds him that we are a deeply interconnected. People from 90 different countries died on 9/11. That means that we have to acknowledge the kind of interdependence that we are dealing with. Second speaker Valarie Kaur Sikh started off with her own story to give a sense on what life had been like for a Sikh in American society. She was a young college student when September 11th happened. She was on the floor of her parents bedroom watching the towers fall over and over. As a young person, whose grandfather had come with a steamship, almost 100 years ago to California from India, she has felt deeply American. When the attack happened, she felt what all Americans had felt; a deep assault, a deep violation, confusion and shock. She said, “Just seconds later, the image of Osama Bin Laden was flashed on the TV, a man with a beard and a turban. It dawned on me that this picture of America’s new enemy looked like my family.” She believes that her community had been marked automatically suspect, perpetually foreign and potentially terrorist. She believes that her community was robbed off the opportunity to grieve. They didn’t have much time to grieve as they were suddenly thrown into a situation where they had to protect themselves. She decided to capture the unseen impacts of 9/11 and sat with mothers and daughters, sons and fathers, and to capture their pain, fear, and their grief at being subject to such hate violence. More importantly, they lost their sense of home entirely. That has lasted for 10 years. She joined Rabbi Baird in stating that the real tragedy is that there are kids who don’t know the pre 9/11 world. There are Sikh and Muslim kids who don’t know pre 9/11 world. They don’t know anything but going to the schoolyard and being called Saddam’s son, or terrorist’s son. They are growing up in the shadow of 9/11. The damage that this is doing to our community is really something we really need to be talking about much more than we do. That was the dark part of it. After the death of Osama bin Laden many people thought things were going to get better as polls showed that half of the Americans before Osama bin Laden’s death had good feelings about Muslims; but poll numbers immediately fell after his death. Further, the mass murderer of Norway cited anti-Muslim American ideologies in his manifesto to justify that. In so many ways, it’s getting worse because there are politicians and thinkers who know that they can profit, and that they can score political points from scapegoating the community. In any event Valarie Kaur Sikh is hopeful. She says, “We are still living in the shadow of 9/11, but there is hope for peace. I am really hopeful about this 10th year anniversary of 9/11”. Sahoib Sultan, Muslim Life Coordinator/Chaplain at Princeton University, remembers the day of 9/11 like today. A student got up and said, “America is under attack” while he was working on a paper at a library at the University of Indiana as an undergraduate student. Almost immediately, they brought on analysts on TV to talk about what was happening, and almost immediately, without skipping a beat, people said this looked exactly like what an Islamic terrorist would have done. Within that moment, he realized something dramatically changed in the library that he was in, in this country and the world. When he walked out of the library, he saw a man in a truck, with a rifle in his hand, and “Death to Muslims” written on his truck. But wider community was supportive. He remembers getting calls from the mayor, and the college president, asking how they could help. The worst is that, 10 years later, over 50 percent of the country has a negative look on the Muslim community, and what this had taken away from him, was never being able to grieve as a human, or as an American. It is sometimes difficult as a Muslim to go into public. He and his wife recently went to the memorial garden in PA, and saw all of the names of three thousand people listed on plaques - Hindu names, Christian names Jewish names, and Muslim names -, and how indiscriminating this attack had been, and what an interconnected world we live in. They were thinking during the visit about what people were thinking about them. They tried to smile but it was difficult. Finally, Rev. 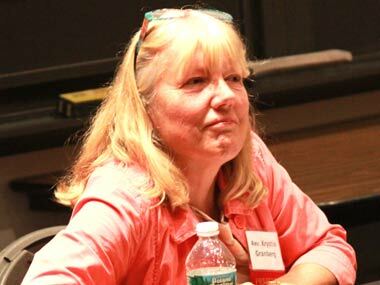 Krysten Granberg was at a multifaith breakfast on homelessness and housing at Riverside Church, in New York City. A preacher was actually talking about safety and security when the big tragedy happened. In that room, there were Muslims, Catholics, Jews, Protestants, ordained leaders, and unordained leaders. Together they all stood in prayer. That was the one moment, in the last 10 years, that really sticks with her, and that inspired her about the hope 9/11 might actually bring in the future. She still asks herself why there is so much anxiety around 9/11. The question now, in fact, is not why there is such anxiety, but what we are going to do about it as it still breaks our hearts. Another concern that became strong in the Christian community is the fear. How do we transform that fear into hope? She also informed the audience of the change in people’s self-identification in terms of religiosity and spirituality. Before 9/11, she stated that there were more people who claimed to be “religious” than those who claimed to be “spiritual. Now, 10 years later, those who self-identify as “spiritual” outnumber those who claim to be “religious”. 9/11 certainly changed Americans’ attitude toward religion. But “I am very faithful”, she concludes.